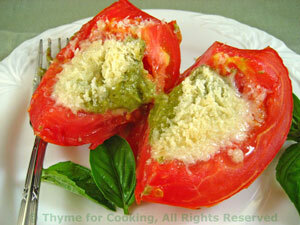 Baked Tomatoes with Pesto, a low cal, low carb from Thyme for Cooking. If you have a very large, Beefsteak type tomato, cut in in half, through the stem, hollow each half and fill. Core tomatoes - cut into the stem end at an angle to take out the stem and center of the tomatoes. Hollow out sufficiently to hold half of the pesto and cheese. Divide the pesto and put into each of the tomatoes. Divide the Parmesan and sprinkle over the top. Put into a small baking dish and bake at 375F (185C) for 10 - 15 minutes. The tomatoes should be cooked through but still hold their shape and the cheese should be starting to brown.